Earlier this year, Microsoft announced the public beta of its Azure RemoteApp service. Just like the name implies, it allows you to run virtualized apps on Azure and use them remotely, no matter whether that’s on a Windows PC, Mac or a mobile device. As Microsoft announced today, RemoteApp is coming out of beta (and getting an SLA) on December 11. During the preview period, RemoteApp was a free service. All you needed was an active Azure account. Starting now, Microsoft will offer a 30-day trial, and after that, users will have to pay. The company will offer two different tiers: basic and standard. 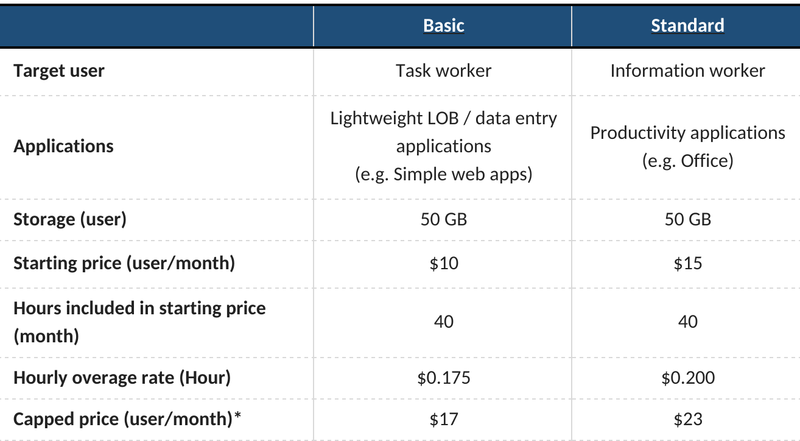 The basic account, with a starting price of $10 for 40 hours and a monthly cap of $17 for users who need to access the service for more hours (at $0.175 per hour), is geared toward task worked who need to run simple web apps. The standard account is for users who need to use more complex application (like Office). Prices for that start at $15 per month with a cap of $23. By early next year, Microsoft will also offer a Volume Licensing plan. Given Microsoft’s focus on hybrid deployments, it doesn’t come as a surprise that RemoteApp is also geared toward businesses that want to host their own apps on their own servers, too. For this, Microsoft offers its aptly named Remote Desktop Session Host. Employees can sign in with their existing corporate credentials (including Active Directory) or use a Microsoft account. The advantage of all of this for large businesses is obvious. It makes it easier for enterprise IT to manage all of these installs through Azure than through traditional means, after all. Other enterprise players like Citrix, however, already offer similar services with XenApp. Microsoft typically relied on these outside vendors to provide these kind of services, but it is clearly interested to get a slice of this market now, too.